KYOTO - A Kyoto University research team said Monday it will begin a clinical test this week using induced pluripotent stem cells to treat Parkinson’s disease, in what will be the world’s first application of iPS technology to the progressive neurological disorder. 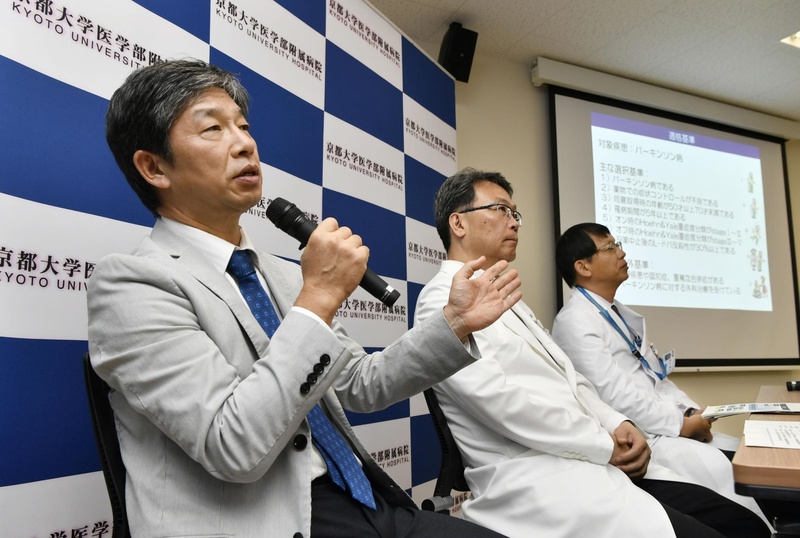 The team led by Jun Takahashi, a professor at the university’s Center for iPS Cell Research and Application, has received government approval and is soliciting seven patients to participate in the trial, which will be conducted at Kyoto University Hospital. 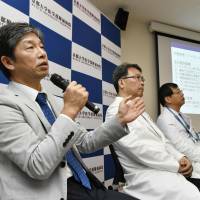 The research team said one of the patients taking part in the study will be selected from those being treated at Kyoto University Hospital. The researchers are aiming to develop the method as a new treatment covered by national health insurance. Parkinson’s disease reduces dopamine-producing neurons in the brain and results in tremors in the hands and feet, and stiffness in the body. While there are treatments to relieve the symptoms, there is currently no cure for the disease. In the clinical test that will start Wednesday, nerve cells derived from other people and stored at the university will be transplanted into the brains of patients to supplement damaged nerve cells. The nerve cells are created using cells from people who have types of immunity that make them less prone to transplant rejections. The team has already tested the process on monkeys in a preclinical study, in which the movement of the affected animals improved without seeing any tumors that could develop into cancer in the brain over a two-year observation period. In Japan, an estimated 160,000 people suffer from Parkinson’s disease. Many patients develop symptoms in their 50s or older, and the number of patients is rising due to the aging of society. Kosei Hasegawa, representative chairman of the Japan Parkinson’s Disease Association, said patients have huge expectations of the iPS therapy. In one of the currently available treatment methods, electrodes are placed inside the brain to send electric signals and alleviate symptoms, even though it is not effective for all patients. A woman who was diagnosed with Parkinson’s disease more than 10 years ago said, “If iPS treatment is established, it will offer more choices for patients with progressed symptoms,” she said. Among other clinical tests of iPS cells, the government-backed Riken institute conducted the world’s first transplant of retinal cells grown from iPS cells to a patient suffering from a serious disease in 2014. IPS cells can grow into any type of body tissue and are seen as a promising tool for regenerative medicine and drug development. Shinya Yamanaka, who heads the iPS center, won the Nobel Prize in physiology or medicine in 2012 for discovering iPS cells.